The Zandiyeh Ensemble of Fars Province is part of the Tentative list of Iran in order to qualify for inclusion in the World Heritage List. Shiraz was the former capital of the Zand dynasty which ruled Iran for merely 43 years. The remains of their 18th century dynasty can mainly be seen here. The town is relatively big and has a fancy metro to get around, basically running along the main road cutting through the city. The ensemble of buildings is at the appropriately named Zandiye station. The navigation app told me it would be another 19 minutes to reach it by car and expecting no parking over there I parked it at the edge of the traffic-laden area where I could later easily turn north onto the ring road to exit the city. The metro is quite new, 2004, and super clean. It also only costs 10k rial (not toman) per ride which is ridiculously cheap. It only ran every 15 minutes but that is still not much slower than driving into chaotic traffic jams and double, triple parking. Once there I saw dozens of exchange offices and many people asking me if I need to exchange money (probably in the hope for me not to know that the unofficial rate and become rich). A short walk from here you can start to see some of the buildings. 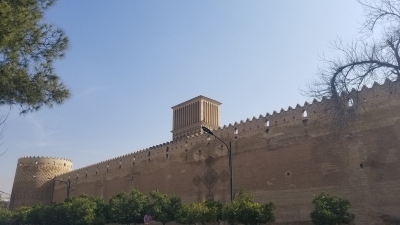 I checked out the massive Karim Khan citadel, mostly interesting for the walls, and the Vakil Bath with its wax figures, the mosque next to it and wandered around the bazaar. I was going to see the Vakil Water Storage but wasn't sure if it is open after 4pm in winter because that is the norm and the Google map times are summer only. It gets dark at 4:30 in January! It's a good way to spend the afternoon as there is so much to see and I looked up the history the night before. You learn absolutely nothing about these aspects of history unless you pick history as speciality or come across it on your travels, like this here. Can easily see this getting inscribed. Pro tip: you can also take the metro to the Eram Persian Gardens, a WHS in Shiraz. If you have a car I recommend driving directly there though.